The Olmec colossal heads on the Gulf Coast - from the crater of the cataclysm - indicate on the obelisks of Africa, which depict the laser beams created by the by the united consciousness of humanity for the Transition on the Highest level of the material world as the only way of salvation. The ornament of the Obelisk of Aksum through symbols of consciousness transmits the detailed Instructions that include the creation of homogeneous- resonant structure of the united consciousness of civilization, as the main stage of the Transition, based on mutual understanding and love. The predictions of Edgar Cayce about the last the 44-th President of the United States means, that the blows of the three pre-cataclysms have to start this year. That is why, the creation of the laser beam of incredible power that depicts the Obelisk of Aksum, is the major goal of humanity for the continuation of life. The Olmec heads indicates the only way of salvation. On the Gulf of Mexico were found colossal Olmec heads with Negroid features and protective helmets. Made of black basalt with numerous symbols of consciousness on their helmets, they amaze by their size - from 2 to 3.5 meters high, 5.5 meters in circumference, weight - from 10 to 35 tons each. What do they represent, and about what they inform? Why are they placed here? Extraterrestrial civilizations inform that in the Gulf of Mexico will be the epicenters of the first and second pre-cataclysms that will occur on the days of autumn and spring equinoxes - 22 September and 20 March respectively. As confirmation, in the Gulf of Mexico, extraterrestrials built numerous complexes with images of serpents - the symbols cataclysm. Among them are such world-famous, as Chichen Itza, Pyramid of the Feathered Serpent Quetzalcoatl in the Mexican complex of pyramids of the Moon and the Sun with the 365th heads of serpents, Templo Mayor, Uxmal, Tulum, Xochicalco, Tikal, Coba, Calakmul, Tula, Lubna and others. Consequently, the Gulf of Mexico - is the crater of the mortal danger to all humanity. Helmets on the Olmec heads - are the symbols of life protection. On the helmets are represented the symbolics of consciousness, which informs that only the unification of consciousness and the Transition to the Highest level of the material world through the universal resurrection - is the only right way to save life. Only it will allow escaping from the jaws of cataclysms and continuing life in the new cycle. Thus, extraterrestrials have placed the Olmec heads on the Mexican Gulf Coast in the crater of the epicenters of two deadliest cataclysms, as a pointer of the only right way of salvation. The Olmec heads with Negroid features of face from black basalt – are arrows-pointers on the African continent, where in large numbers than anywhere else on the globe, are presented obelisks and steles of a great height. In the symbolics of consciousness the obelisks and steles depict the laser beams, which have to cause the united consciousness of the Earth civilization for the Transition to the Highest level of the material world. So is shown to mankind the most important element of the Transition - the laser beam, without which the salvation is impossible. The huge height of the obelisks from 20 to 40 meters informs that for the Transition the united consciousness of civilization has to create the laser beam of incredible strength. The obelisk-monolith, made of a single piece of granite - one of the hardest materials on the planet - depicts the incredible cohesion which people of Earth have to form the through the united consciousness for the Transition on the basis of mutual understanding and love. The granite monolith informs that the cornerstone of the unification of consciousness has to be the golden principle of morality - love your neighbor as yourself. Obelisks, often installed in pairs, represent the Principle of the united consciousness - the basis of the Transition. The symbolics of consciousness on the helmets and the obelisks. On the obelisks and steles, as well as on the helmets of the Olmec heads, is represented analog and digital symbolics of consciousness covering, sometimes, the entire surface from top to bottom. The symbolics of consciousness informs that the obelisks, as well as the Olmec heads were made by extraterrestrial civilizations. So, why it was so important for extraterrestrial civilizations to transmit mankind this information about the necessity to create the laser beam of the incredible power through the sea and oceans, from continent to continent? It turns out, that this, the most important element of the Transition is connected with the structural features of the information cell of individual consciousness of a human of carbon nature. For the Transition is required the creation of a single cell of humanity, which is possible only at the confluence of all individual cells of people of the Earth. However, carbon nature of humanity creates extremely wide and rigid borders of human individual cells, which, at the unification of consciousness, do not allow brain areas of cells to form the overlap area for information exchange. Brain areas of cells only touch each other, that’s why at the unification of consciousness the action does not arise, which would have caused the compassion and mutual understanding. As a result, enormous width and rigidity of borders of individual cells of people is revealed in hate, wars, acts of terrorism, greed, deep indifference to t fates of other people, a huge number of suicides and others. Realizing that the people of the Earth do not even suspect of the enormous broad and rigid boundaries of their cells, extraterrestrials repeatedly demonstrate to humanity these cells’ boundaries in different complexes. 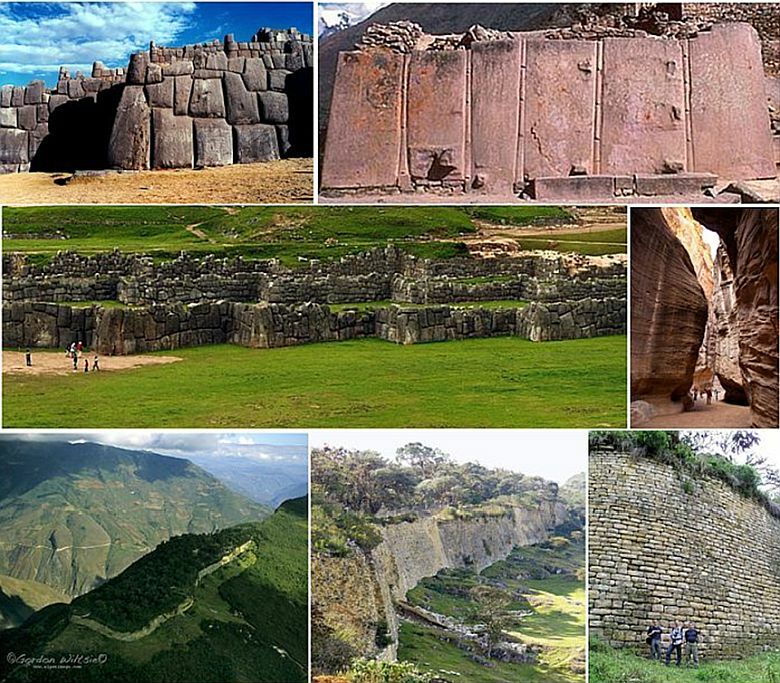 This are three cyclopean gear shafts of Saksaywaman in Peru, representing the structure of a human cell, which includes three previous levels of consciousness; the Wall of six megaliths of the temple of the Sun in Ollantaytambo in Peru; hundred-meters height walls of the Siq passage in Petra in Jordan, a huge hight walls of the fortress Kuelap in Peru and others. This deep imperfection of human consciousness, based on the features of cells of carbon nature is deadly dangerous for the Transition. This is what about the Bible warns with the help of the so-called « the Number of the beast 666» – a human and apocalyptic , because it is considered that it will be decoded before the End of the world. It turns out, that the number 666 in the digital symbols of consciousness represents enormous wide and rigid boundaries of individual cells of mankind of carbon substrate. Thus, the number 6 indicates on carbon basis of mankind, since carbon has a serial number of six in Periodic table of the сhemical elements of D. I. Mendeleev. The threefold repetition of the number 6 in the Number of the beast 666 means that carbon nature have also three previous levels of consciousness included in a human cell - the inorganic nature of stars, as well as inorganic and organic nature of planets. 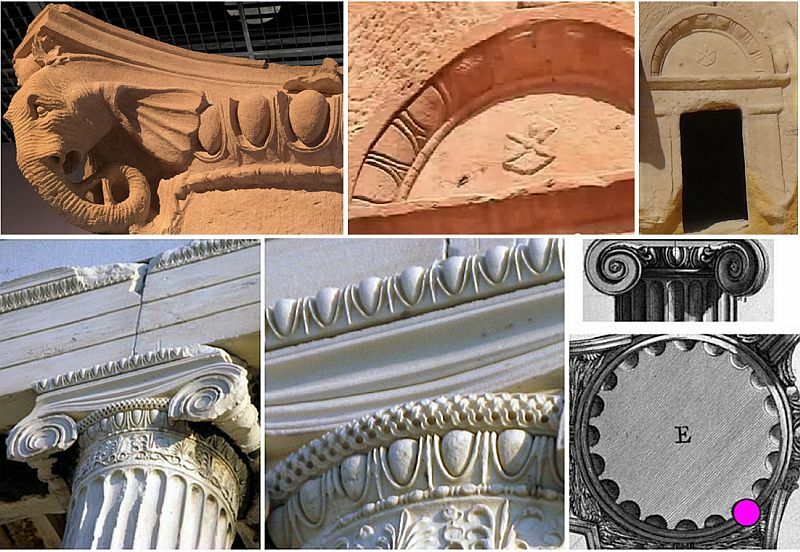 The Number of the beast 666, very clear is represented in the ornament of the great Parthenon and other temples of the Acropolis in Greece, in many Greek ancient temples and structures, as well as in ornaments of rock tombs in Petra, Jordan, and Madine Salih, in Saudi Arabia. In all complexes the Number of the beast 666 is represented as triglyphs-tridents with six gutami- short cylinders or with six expanding cones. Thus, a trident depicts a human consciousness, and three teeth of a trident depict the three previous levels of consciousness, which are included in a human cell. Six gutami-cylinders or six cones inform about the carbon-basis of humanity. Bas-relieves -metopes between the triglyphs on the Parthenon depicting the Centaur, with the head and upper torso - a man and the lower part - a beast, that is choking a man, inform that a beast basis of human, often win, get an upper hand over human consciousness. Thus, the number of the beast 666 discloses major imperfection of human consciousness, manifested in the three previous levels of consciousness, included in his consciousness - the fury of stars, the indifference of minerals, the ferocity of beasts. Mortal danger for the Transition of this peculiarity of consciousness of humanity, which suddenly will be manifested in the critical situation of the onset of global cataclysms, compels repeatedly warn about it people of the planet. Thus, the inverted cross of St Peter for two thousand years warned about the possibility of only deliberately overcome this imperfection of consciousness, turning hate to mutual understanding and love. The laser beam to destroy the borders of individual cells. Broad and rigid boundaries of cells are impossible to soften. They can only be burned by the laser beam of enormous power. This beam should cause the united consciousness of civilization, as the action. By the burning of the borders of individual cells, the laser beam, thus, will allow to form a single cell of civilization. As a result, our bodies will be destroyed on the level of the Crystal Structures, where we now live, for the General resurrection on the Highest level of the material world. This is the only way to continue life of mankind already in the new cycle and new conditions, but also in the harmony of the Earth. The stages of the Transition of mankind in the next cycle of life reveal a world famous legend about immortality and resurrection from the ashes of a fiery bird Phoenix, the symbol of which it is. Phoenix Bird lives 1000 years. Foreseeing death, Phoenix burns himself in his nest. From the ashes resurrects the renewed Phoenix and continues the journey of life. Two groups of people to generate the laser beam. To create the laser beam and its multiple amplification, are required two groups of people. On the one hand, people of the highest consciousness, who dedicated their lives to prayer, will cause numerous laser beams by their consciousness, as igniters. However, they are not strong enough to rupture the incredibly rigid and wide boundaries of individual cells of the whole civilization simultaneously, and humanity has multiply amplify these rays. For multiple amplification of the laser rays-igniters, there is a special technique based on the creation of homogeneous resonant structure of consciousness, created by civilization. It is achieved by synchronizing of consciousness of people of Earth by means of breathing. This information is disclosed in the ornament of Ethiopian obelisks-skyscrapers. Thus, as a result of interaction of the two groups of people will arise the laser beam of incredible power that will destroy bodies at the level of the Crystal structures for the General resurrection on the secure Highest level of the material world and continuation of life. Consequently, nowhere on the Earth will be impossible to escape from global cataclysms of the planet destruction. In addition, nobody can make the Transition by himself. Either all humanity simultaneously will make the Transition, or the whole civilization of Earth will perish. So, the Egyptian granite obelisks of Pharaonic times were taken from Africa to Rome, Paris, London, New York, Istanbul, Florence, Caesarea, in Israel, as well as Urbino, Catania, Sicily, Arles, France and other cities. From Ethiopia in 1937, has been taken out and set in Rome the Obelisk of Axum, and was returned only in 2005. Transportation of the Obelisk with the help of the An-124 aircraft was carried out in three stages, on each of which was transported one-third of the monument of a total weight of 160 tonnes and a length of 24 meters. So, together with the obelisks the information about the ultimate goal of mankind on Earth - the creation of the laser beam by the united consciousness for the Transition and continuation of life, spread throughout the world. Park of obelisks and «skyscrapers» of Ethiopia. In Axum and the surrounding area there are very many obelisks of relatively small size - about one hundred and seventy. A big number of obelisks, placed in a small area, pay attention on the ornamented monolithic obelisks presented here. Single-type ornament of obelisks in the form of windows and doors is carved across whole vast height of the obelisks. This ornament forms the image of a residential building, resembling modern skyscrapers. Therefore, they were called «skyscrapers» of Ethiopia. 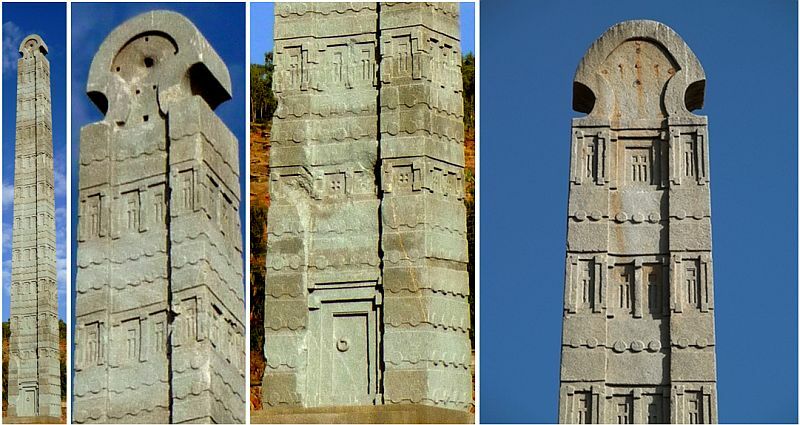 In Axum, Ethiopia there are a few such obelisks-monoliths with ornament, resembling skyscrapers. The highest obelisk-skyscraper – the Great Stela of 33.5 m hight, i.e. 12-storey building and weight about 520 tonnes, is lying broken into several pieces. Widely known is the other, so-called the Obelisk of Axum, 24-metre-tall, i.e. hight of a 7-storey building and weight 160 tons. It is believed that the Obelisk of Axum was founded in the IV century BC, i.e. this is a 1.700-year-old granite stele-obelisk. 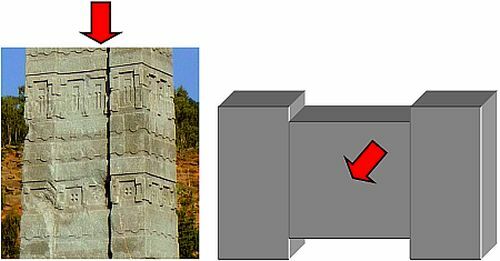 The Obelisk of Axum is installed near King Ezana's Stela, which is also ornamented, its height is 20.6 meters and weight 160 tons. 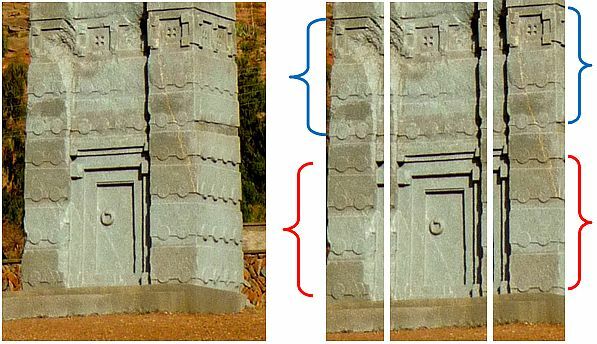 The broken Great stela, the Obelisk of Axum and King Ezana's Stela have almost identical ornaments. Thus, the broken Great stela and the Obelisk of Axum are completely covered with ornaments, and King Ezana's Stela has ornament only on three sides – on the front and two literal. Syenite – the material of bluish color, from which were carved stele monoliths, is a type of granite - a very hard stone, which mineral deposits is not nearby. How it was transported there - still remains a mystery. The Ornament on the Obelisks-skyscrapers – are the Instructions for the Transition. Carved ornament on all obelisks-skyscrapers entirely consists of analog and digital symbols of consciousness. The analog symbolics is the same and is represented by rectangles and squares, depicting windows and doors, as well as interconnected circles of equal diameter, encircling the obelisk at different levels. For the transmission of information is used also various digital symbolics from one to ten. 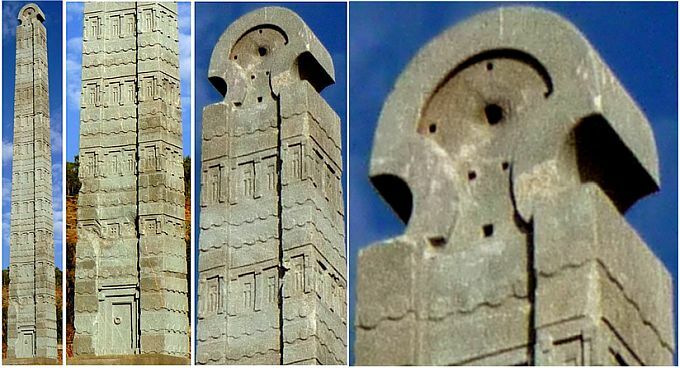 Multi-level ornaments on all Aksum obelisks-skyscrapers transmit the detailed Instructions for the Transition of humanity in the next cycle of life. They inform, how to light a laser beam. formation of the laser beam of incredible power, caused by the action of the united consciousness of humanity. 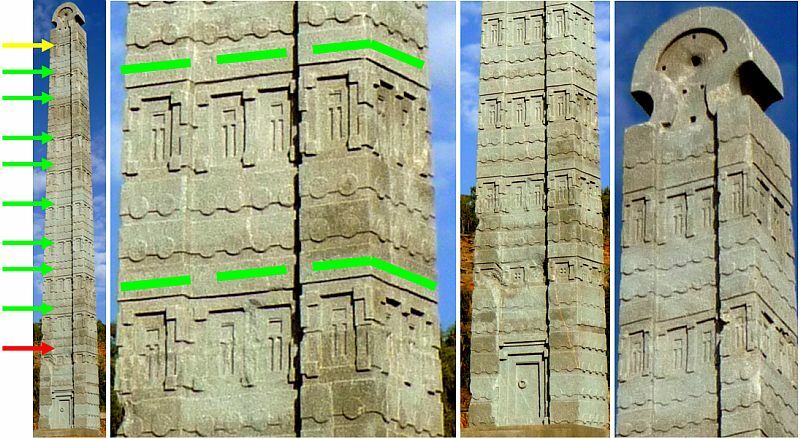 Let’s consider what information transmit the carved ornaments on the Obelisk of Axum - the most famous «skyscraper» of Ethiopia. The Obelisk of Aksum –is an information pictogram of extraterrestrial civilizations with ornament made of symbols of consciousness that convey the Instructions for the Transition through the laser beam of incredible strength, which has to cause the united consciousness of mankind. This laser beam represents the Obelisk. Each element of the pictogram informs about human consciousness and depicts either individual or united consciousness, which is necessary to form humanity for the emergence of the laser beam. Reading of the pictogram is from bottom to top. The surface of the Obelisk is covered with numerous rows of interconnected Circles and Windows, located between them, creating the image of a multistory building-skyscraper. What do these two elements mean in the symbolics of consciousness? Circles. Each Circle represents a brain area of an individual cell of a human – so is shown human consciousness. Interconnected Circles represent mankind of Earth that had united consciousness for the Transition. Windows. Square Windows depict a human consciousness of the fourth level. The Windows in the form of elongated rectangles represent a shift of brain area as a result of unification consciousness of people of the planet. Digital symbols. 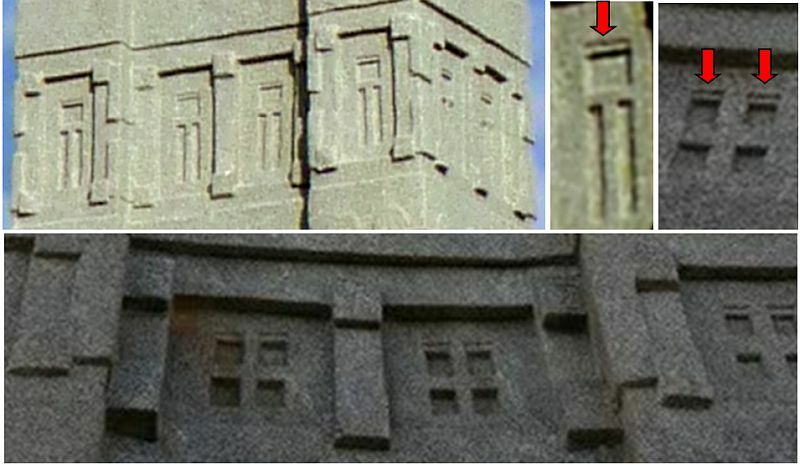 In the carved ornament on the Obelisk is used various digital symbolics with the numbers from one to ten. Thus, the number one represents an individual consciousness. The number two reveals the Principle of the united consciousness - the basis of the Transition. The number three disclose the structure of an individual cell, which includes three previous levels of consciousness. The number four, on the one hand, represents the fourth level of human consciousness. On the other hand, this number discloses the Principle of the united consciousness on the base of two pairs of people. The number five represents the united consciousness of humanity. The number six on the one hand, characterizes carbon nature of life on earth. On the other hand, it represents the Principle of the united consciousness from the point of view of the structure of a human cell that includes three previous levels of consciousness. The number ten reveals the Principle of the united consciousness with a five-fold amplification. So, about what the Obelisk informs? Along the height the Obelisk is divided into ten levels-«floors» and is ended by the top. Each floor comprises a number of Windows and the two series of Circles. The borders of floors are located above the boundaries of each line of Windows. The boundaries between the «floors» are indicated by a broad closed tape encircling the construction by the perimeter – shown by green dashed line. The tape repeats the profile of the construction and therefore is divided into four rectangles - two long on the façade and back part and two short – on the lateral. Thus, long rectangles shown on the front and back of the Obelisk, in turn, are divided into three parts and depict individual and united consciousness as the basis of all stages of preparation for the Transition. Lateral rectangles are the whole and depict the shift of the brain area at the unification of consciousness. Ten floors one by one from bottom-up consistently disclose the Instructions for the Transition through the laser beam that depicts the Obelisk. Thus, each floor informs about a specific set of actions that Earth civilization is necessary to make at every stage of preparation for the Transition in order to cause the laser beam of incredible strength that the Obelisk depicts. The ornament divides the First floor on two levels - the Door and above the Door. Thus, the ornament of Windows of the First floor is different from the other nine floors, and depicts the square Windows. The ornament of remaining nine floors is identical and is presented by rectangular Windows. Thus, the ornament divides the Obelisk on three levels – the Door, the Top part, as well as 10 floors, which represent three fundamentally different phases of states of consciousness of Earth people that will arise at preparing for the Transition. The vertical division. The front and rear surfaces of the Obelisk are divided into three parts - a wide central part and two narrow parts by the sides. Thus, the central part is slightly recessed relatively the side parts. In the central part of the First floor on the low level is presented the Door. On the upper level of the First floor, as well as on the rest 9-floors are depicted two rows of four Circles and two Windows. So is depicted the unification of consciousness of four pairs of people in the cells of which the brain area shifts to the cell’ border, and calls an action. Thus, the central part on each level contains two windows and in two lateral parts - one window. So are depicted two people that are uniting consciousness. Consequently, a number of windows, located on one level, represent the Principle of the united consciousness. On the lower level of each of side parts of the First floor are presented by four pairs of interconnected Circles. So are depicted four pairs of people that have united consciousness. On the upper level of each of side parts of the First floor, as well as on the rest 9-floors are depicted two rows of Circles by two Circles in each, and by one square Window. So is presented consciousness of two pairs of people who are prepared for unification of consciousness, in order to trigger the action in the form of the laser beam. The side surfaces of the Obelisk comprise two rectangular Windows and two levels of interconnected Circles. On each level are presented four Circles. This ornament reveals the Principle of the united consciousness - the basis of the Transition to trigger the action that creates the laser beam. Floors. Each floor, disposed between two boundaries, is composed of two information layers. Circles. The First level – from below - form two horizontal rows of Circles, connected with each other, which represent the unification of consciousness of people of the planet. Windows.The second level on each floor form the Windows, which depict consciousness of people of the planet. On the First floor of the Obelisk are presented square Windows. They inform about the preparation of mankind to fulfill the Instructions, which are based on the Principle of the united consciousness. The square shape of the Windows means that the action of the united consciousness does not arise. On all other nine floors are presented rectangular Windows, which inform that in the result of unification of consciousness of people of the planet happens a shift of brain areas and arises the action. Change the shape of the Windows along the height of the Obelisk from square to rectangular, informs about change of regime of consciousness from individual to the united in the process of preparation for the Transition and the arising of the action. The action is necessary for the emergence of the laser beam and the destruction of a body at the level of Crystal structures. The homogeneous-resonant structure of consciousness. Extraterrestrial civilizations inform that for the emergence of the laser beam of a huge power is necessary to strengthen the numerous laser beams, lighted as igniters by people of the highest consciousness. This multiple amplification can be created only through the homogeneous-resonant structure of human consciousness. The most important condition for the creation of such a structure is deep understanding and love of all people on Earth, that are connected by a single destiny. These conditions, required for the Transition, are also shown in the Obelisk. Nine floors with the same monotonous repetitive ornament depict the homogeneous-resonant structure of consciousness, which has to form the civilization of Earth after the synchronization of consciousness. Consequently, the homogeneous-resonant structure of consciousness is required for multiple amplification of numerous laser beams, created by the righteous. It will allow creating the action of the united consciousness in the form of the laser beam of incredible power that depicts the Obelisk. So, the ornament on all ten floors shows that at association of consciousness of people arises an action. Thus, the upper floors inform that the force of the action multiply increases in the result of the creation of the homogeneous-resonant structure and on the tenth floor reaches the maximum value, capable to cause the laser beam. About this already informs the Top of the Obelisk. The first floor from below – is the highest (up to the red line). It includes the Door, the first row of Windows, as well as six rows of interconnected Circles. This block informs about the initial stage of preparation of civilization to unite consciousness and setting the single goal. The Door with the Handle - the main condition of the beginning of the Transition. The great height of the Obelisk figuratively depicts the way to the Highest level of the material world, i.e., to the kingdom of heaven. However, the entrance to the building, which leads to the Highest level, is blocked by the image of the Door. The Door is closed, but on the Door there is the Handle that allows opening it for the Transition. The Handle represents the cell of the united consciousness with expanded brain area. Thus, it is said that mankind will be able to make the Transition to the Highest level of the material world, just only by changing consciousness mode from individual to the united. So, the Door with the Handle discloses the main condition for the beginning of the Transition - the creation of the united cell of Earth civilization. Moreover, the Handle consists of two elements - a ring of a large diameter, which is attached to the Door by the ring of a small diameter. The small ring depicts a small brain area of a cell of individual consciousness, and the large ring represents expanded brain area of a cell of the united consciousness. These two rings are disposed in two perpendicular planes, which means that individual and united consciousness are diametrically opposed on the possibilities. And, indeed, only the united consciousness causes an action, capable to make a variety of conversions in accordance with the intended goal. The form of the doorway. The rectangular form of the door depicts a shift of a brain area that occurred in the consciousness of mankind of the fourth level. Several extensions of elongated rectangle of the Door show that the united cell of civilization has arise in the result of a shift of brain areas in all cells of people and will be expanded by increasing number of accessions of people. Four large square elevations, located along the perimeter of the Door at the top and bottom, represent the unification of four people of the fourth level of consciousness. Located by pairs «top-bottom» square elevations disclose the basis of Transition – the Principle of the united consciousness that will allow to trigger an action in the form of the laser beam, necessary for a body destruction. A Strip of the multiple parallel lines - a symbol of a body destruction. At the top of the Door along its entire width there is presented a narrow horizontal Strip which consists of numerous short vertical parallel lines - a symbol of a body destruction. Along the ends of the Strip on both sides are presented two small squares, which depict two brain areas of two cells of individual consciousness of two people. So, the action for a body destruction had caused the unification of consciousness of people in pairs – the Principle of the united consciousness. This combination of symbols informs that the action of the united consciousness in the form of a laser beam will lead to a body destruction at the level of Crystal structures, where will soon begin global cataclysms, for the General resurrection at the Highest level of the material world. The location of the symbol above the Door informs that a body destruction will happen at the final stage of the fulfillment of the Instructions. The symbol of a body destruction is represented in many complexes of extraterrestrial civilizations, world famous for humanity. This is a headdress of the Great Sphinx in Egypt, and a headdress of a man in Gran Pajatén in Peru, numerous steps with different step on the Road of the Dead in the complex of the Pyramids of the Moon and the Sun in Mexico, in Peru it is presented by a cascading terraces of Machu Picchu and Pisac, Olyataytambo and Moray, numerous strips on ornament of Carajía sarcophaguses and others. Circles. The Door from three sides is surrounded by numerous Circles of equal diameter, interconnected by horizontal lines, forming rows. Six rows of interconnected Circles by the Door height, represent a huge number of people - the civilization of Earth that had united consciousness and made the decision to cause the laser beam for the Transition, in accordance with the Instructions of extraterrestrial civilizations. The number six points to carbon nature of mankind and extremely broad and rigid boundaries of individual cells, which are impossible to soften for creation of the single cell of humanity. Borders of cells only can be burned by the laser beam that depicts the striving upward Obelisk, as the main goal, facing civilization. A Crescent from Circles at the Door level. On both sides of the Door there are four rows of interconnected Circles. Two Circles in each row represent two connected brain areas of individual cells of two people, uniting consciousness. So is presented the Principle of the united consciousness - the basis of the Transition. Number four means the fourth level of human consciousness. Besides, the interconnected circles at all levels completely engird the Obelisk, being closed. 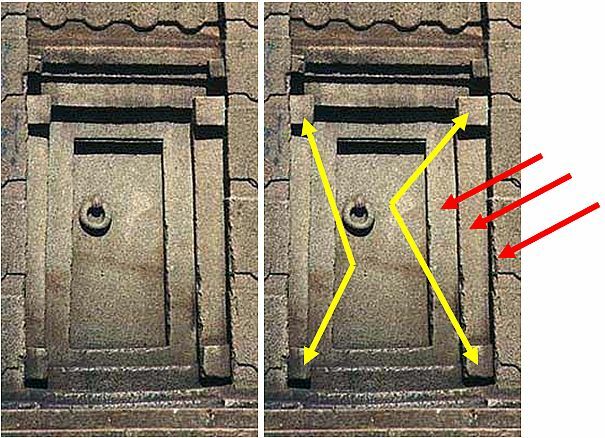 Thus, the lowest four rows of Circles lying at the basis of the Obelisk, not completely engird the Obelisk on the width of the Door. Circles form a crescent of the united consciousness, which arises as a result of the shift of a brain area to the boundary of the cell, at unification of consciousness. This way is shown that at the basis of obtaining of the laser beam, which represents the Obelisk, lays united consciousness of civilization. The two vertical lines of Circles on the sides of the Doors contain six rows of interconnected Circles, by two Circles in each row. So in each line is depicted the united consciousness of two people, each of them comprises three previous levels of consciousness. Circles above the Door. Above the Door in the central part of the Obelisk are depicted two rows of interconnected Circles by four in each. Four Circles, on the one hand, represent four brain areas of four people, united consciousness for the Transition. On the other hand, they represent the Principle of the united consciousness. Additionally, two rows by four Circles in each depict two people, united consciousness for the Transition. It shows the Principle of the united consciousness. Two rows of Circles between the rows of Windows inform that happens unification of consciousness for the Transition of people of the planet. Thus, the first two rows over the Door, inform that this process has begun, and every subsequent two series of Circles, interspersed with a row of Windows, report that this process continues. Windows. Square Windows of the first floor. Each Window consists of four cut small squares, each of which depicts fourth level of individual human consciousness (yellow circle). It represents four people uniting consciousness. Thus, the bottom row consists of the usual squares (green oval), and the upper part of the upper row of squares is shifted and expanded (the orange oval). It shows that at the beginning, people of the planet are only uniting in order to set a goal, and then begin to unite consciousness for the Transition, and in each cell a brain area begins to shift. Flat square (red square), on which are placed these four small squares, depicts an expanded brain area of the united cell. Four protruding squares, presented at the corners of the flat square, depict four people that unite consciousness (blue Circles). The square informs that every human corresponds to the fourth level of consciousness. Long vertical crosspiece between the two squares indicate a shift of brain area that occurs in each individual human cell at association of consciousness (pink oval). Elongated rectangular Windows, presented on all floors, except the first, contain two levels - a wide rectangle, under which are located two long narrow rectangles. Wide rectangle represents the fourth level of consciousness of two people that are uniting consciousness. This process of unification of consciousness is represented by two narrow rectangles, each of which depicts a shift of a brain area in the individual human cell, at unification of consciousness. The wide rectangle - is the resultant and in its upper part, as well as in square Windows of the first floor, is represented a common shift of a brain area, which occurred in the united cell. 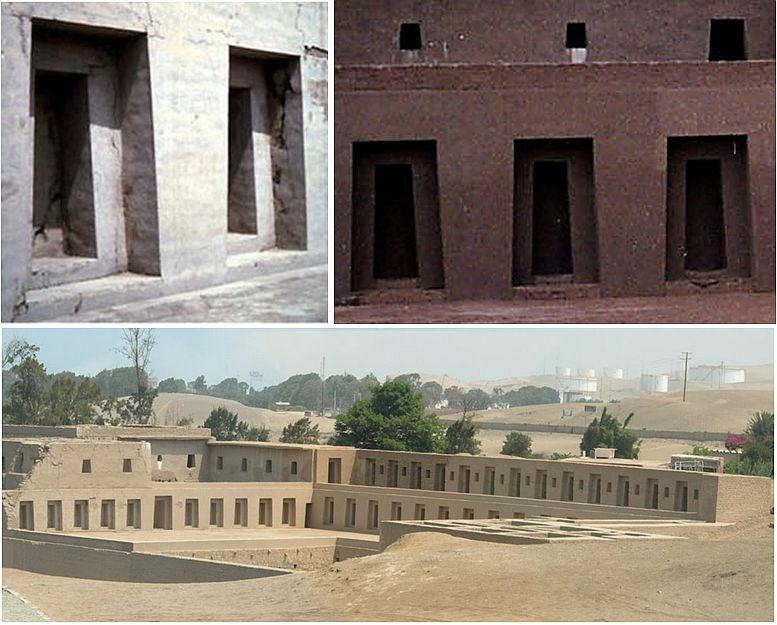 In larger scale the shift and the expansion of brain areas in individual human cells as a result of unification of consciousness, is presented in the Temple Mamacones in the complex Pachacamac, in Peru. Symbols of consciousness on the level of windows. Windows are separated by a different kind of symbols depicting a shift and expansion of a brain area – it is two processes that occur in the cells of people at association of consciousness. A shift of a brain area depicts long vertical rectangles between two squares, represented above and below. These symbols are clear presented between the windows, but also multiply repeated in other places at the level of windows along the perimeter of each floor, emphasizing, thereby, the unification of consciousness of people of the planet. Expanding of a brain area as a result of unification of consciousness depict T-shaped symbols - double and single, represented by two or by pairs, thus showing the Principle of the united consciousness. T-shaped symbols are widely represented in the Gobekli Tepe in Turkey. T-shaped element of the expansion of consciousness. It has to be noted that all windows are combined by pairs. Thus, the two central windows on the facade of the Obelisk are shown on the recessed surface. Side Windows are presented on each side only by one. However, in fact, they are connected with the same Windows on the lateral faces through a rib. A special T-shaped element of the ornament indicates this connection. Moreover, at the lowest level of windows - above the Door, i.e., as if on the first «floor», windows are connected by double T-shaped element (blue oval), and at all subsequent levels, this element is divided by wide strip into two parts (yellow ovals). Т-shaped element depicts the expansion of a brain area at association of consciousness with a common goal. Therefore, such sequence of its presentation by levels, informs that at first humanity had united consciousness, but the goal was not clearly formulated, so it has not caused the action. On all subsequent floors, through the double T-shaped elements, is shown that a brain area is already expanded, therefore united consciousness of civilization already is causing an action. The Obelisk in cross section also represents two connected T-shaped figures. T-shaped element, depicting the expansion of a brain area at association of consciousness, is presented also in other complexes of extraterrestrial civilizations. In Peru, on the way to Machu Picchu T-shaped element forms the Inca bridge over a deep precipice. The bridge clearly shows that the absence of the upper expanded part of individual logs, means that the path is interrupted. This part of the bridge from logs depicts the expanded brain area of cells, completing the unification of consciousness and calling the action. In Bolivia, in the complex Puma Punku numerous T-shaped elements, for example, connect between each other by pairs huge slabs, each of which depicts an expanded brain area of people that unite consciousness. In Turkey, in the ancient complex of Gobekli Tepe - the world's oldest complex, T-shaped elements form circles, depicting brain areas of individual cells, expanding as a result of unification of consciousness of many people of the world. T-shaped element from the «window frames. » Window fames between two long rectangles also form T-shaped element, which informs about the expansion of a brain area at association of consciousness (pink oval). Windows from two sides are separated by elongated elements, representing a shift of a brain area (blue oval). So, on each floor the ornament informs about the association of consciousness of people that is causing the action for the Transition. The apex of the Obelisk – is the last the highest level of the Obelisk. The apex informs about realization of the set by humanity goal to create the single cell, meaning the creation of the laser beam. The great height of the Obelisk indicates that has been created the laser beam of incredible power. The apex consists of two parts. The lower part of the apex is ended by one line of interconnected Circles. The upper part of the apex consists of three semi-circles – one of a large diameter at the top and two of smaller diameter - on the sides. The width of the Obelisk complements each of them till a half-cylinder. Two small half-cylinders on the sides, present two uniting cells of individual consciousness, and a half-cylinder of larger diameter over them depicts the cell of the united consciousness of Earth civilization. So is shown the Principle of the united consciousness that underlies the Transition on the Highest level of the material world. Metal inserts on the apex of the Obelisk are shining in the sun, showing that the action of the united consciousness of humanity had caused the laser beam for the Transition. Monotonously repeated on the nine floors the ornament of the Obelisk consists of symbols of consciousness and depicts homogeneous-resonant structure of consciousness, which has to create mankind in order to increase laser beams that will be lighted like igniters by people of the highest consciousness. Homogeneous-resonant structure of consciousness is created on the base of synchronization of consciousness by means of breathing and is necessary for multiple amplifying the action of the united consciousness in the form of the laser beam, required for the Transition. Synchronization of breathing of all people in the world is created by special exercises, which are represented in the school «Art of Living». One of the best techniques of rhythmic breathing is Sudarshan Kriya that is easy to learn and is very effective. In the symbolics of consciousness the process of the emergence of homogeneous-resonant structure of human consciousness is represented as the overlaped zone of two brain areas of individual cells of people as a wide oval – the oval of the Transition. It is formed in the result of superimposing brain areas of cells, i.e., deep unification of consciousness of people with the softening of the borders of cells. Ovals of the Transition in the Acropolis, Petre, Madin Salih. Homogeneous-resonant structure of consciousness of humanity is shown in many complexes of extraterrestrial civilizations by multiple repeating of the ovals of the Transition in the form of egg-shaped ornament. It is presented at Petra in Jordan on the capitals of columns in the Great Temple, on rocky tombs of Madin Saleh in Saudi Arabia, on the capitals of the Erechtheion in the Acropolis in Greece. This ornament, consisting of an egg-shaped element – oval of the Transition which is alternating with an element shaped like an arrow leaves is known as Ionic ornament. Arrow- leaves between ovals depict rhombuses, which inform that the ovals of the Transition were formed in the result of unification of consciousness of people of the fourth level of consciousness. In the symbolics of consciousness the fourth level of consciousness is indicated by a square or a rhombus. Thus, the rhombus means, that happened the unification of consciousness and arise an action that turned the square into a rhombus. Ionic or the Ovals of the Transition, presented near, inform that happened deep unification of consciousness with the superimposition of brain areas of cells that had caused the action. Ornament with Ionic is also presented at the bottom of the base of the famous Porch of the Caryatids in the Erechtheion temple, as well as on the baskets, placed on the heads of the six statues of the Women. Installed above the heads of the women on the baskets flat squares indicate that this is the fourth level of human consciousness. The image of the Elephant for synchronization of breathing. In the complex Petra, in Jordan is informed that only breathing is able correctly and quickly to synchronize consciousness of humanity for the Transition. For transfer this information is used the image of the Elephant. «The Elephant-Fish» in the passage Siq. Dual image «Elephant-Fish», presented in the Siq passage, through which visitors pass at the beginning of the route, pays attention to the image of the Elephant, to which in the complex Petra is given an essential role - to inform about the breathing, as the basis for synchronization of consciousness. Moreover, the association in one rock image two completely incompatible creatures living even in different environments - Fish and Elephant, indicates that the information that Elephant transmits to humanity will be vitally important at the occurrence of global cataclysms, connected with the water element, which depicts the Fish and passage Siq. The passage Siq in Petra. Rocks in the passage Siq on the way to Al Khazneh in Petra of hundred-metre height are covered on both sides by horizontal and oblique lines, depicting pouring streams of water. This picture is complemented by vertical lines on the rocks, also representing the vast water streams. Thus, entering the Siq passage, of about 1.5 kilometers long, people, as if get in a rushing stream of water by hundred-meters height of incredible strength, from which it is impossible to escape. Image of a flow, sweeping away everything on its path, underline the colors of rocks, sometimes even with a glossy covering, creating an overall impression of wet surface. This information about flowing down from rocks never-ending streams of water increases the aqueduct that runs along the road of the passage Siq at a height of about one meter. The narrow passage through which today are walking people – is a conditional path, which presented to humanity Al Khazneh that is standing at the end of this path and is revealing to mankind the way to the future. This narrow passage resembles a passage in the parted waters of the Red Sea, in which Moses was able to lead the Israelites out of slavery in Egypt, thus opening a great free future. In reality, the powerful flow of cataclysm will not have any passages. It will be continuous. Only today, when still there is time before the beginning of cataclysms, the only way of salvation is disclosed to humanity by analogy with the information about the Transition on the other Highest level of the material world. Today humanity, walking along the narrow passage through the deadly stream of raging water, the walls of which practically connected to each other, is shown that from there, is already impossible to escape. And only Al Khazneh, standing ahead, like a lighthouse, points the way of preservation of life, the path to the future. Only following the Instructions of extraterrestrial civilizations that clearly indicated the main stages of the Transition, humanity will be able to continue life. The culmination of the information transmitted by the passage Siq, is the dual image of the rock - «Fish-Elephant», which, simultaneously, warns of mortal danger of global cataclysms, and indicates the only way of continuation of life. Moreover, the dual image demonstrates the Principle of the united consciousness - the basis of the Transition. The time will come, informs the Fish-Elephant, and before beginning of global cataclysms humanity will have to make the Transition, which is based on the creation of the laser beam of incredible power. To amplify the laser beam will be necessary to create the homogeneous- resonant structure of consciousness by means of breathing, about which inform Elephants’ Heads on the capitals of the columns of the Great Temple. Elephants’ Heads and synchronization of breathing. 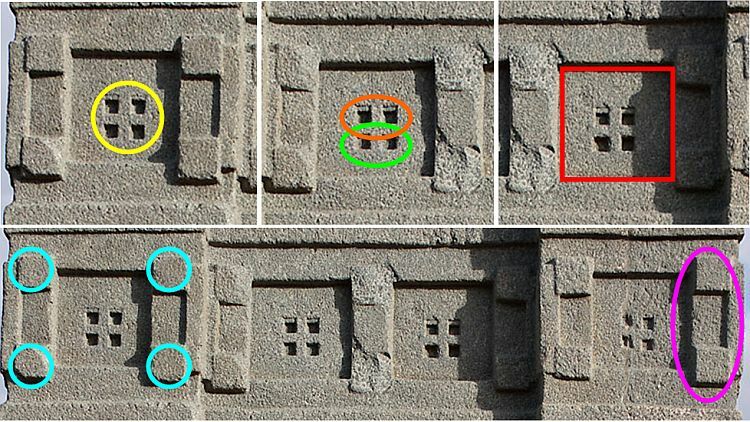 The technique of forming of homogeneous-resonant structure of consciousness disclose in Petra images of Elephants’ Heads, alternating in the ornament with ovals of the Transition. Elephants’ heads with open mouths and dilated nostrils inform that the homogeneous- resonant structure of consciousness for the Transition is created by the synchronize breathing. Elephants’ heads by four on the capitals of each column of the Great Temple it Petra disclose the Principle of the united consciousness. The laser beam, necessary for burning borders of cells at the Transition depict the Obelisks presented in many complexes of extraterrestrial civilizations. In Petra the Obelisks are presented in several places. These are four obelisks on the tomb of the Obelisk in the Bab-as-Siq. Two separate Obelisks on top of the sacred mountain, as well as Nefesh near Tomb 70. Two types of Obelisks are presented at Al Khazneh. One vertical standing laser-obelisk is shown on the side surface of a cliff along the entire height of Al Khazneh. In addition, two huge laser beams extending into the rock are presented in the upper part of Al Khazneh. In Xochicalco, Mexico extraterrestrials demonstrate a great power of the laser beam necessary for the Transition, through a very powerful stream of light that passes through a hole in the ceiling of the cave, when the sun is at its zenith. Usually, a stream of sunlight is very weak. And only twice a year, on May 14-15 and July 28-29 at astronomic noon, when the sun is at its zenith, the light rays penetrate through a hole in the ceiling, creating an incredible stream of light of great power. This stream of light is so strong, that if under it put a hand, will be visible arm bone, as at X-ray. Deep mutual understanding and love as the basis of the Transition. Before the beginning of global cataclysms, deep awareness of the unity of the fate of the people of Earth, and the interdependence of each other, have to cause the desire to become one great family, based on a deep love for each other. Back to back - will not pass! Only face-to-face and hugged! Extraterrestrials repeatedly warn that this is only possible as a result of deliberate overturn of consciousness of humanity from hate to love and mutual understanding. The incredible importance of this condition means, that the only sincere love is able at some extent soften borders of cells of Earth mankind for a deep information exchange at the formation of homogeneous resonant structure of consciousness. Insincere love will not be able to soften the borders of cells and the Transition will be impossible. Even despite of a thorough fulfillment of all other conditions of the Transition, failure to do so - will only lead to loss of valuable time, with no possibility to cause the required action. According to the warning of extraterrestrial civilizations humanity of the Earth has a chance to make the Transition only before the second pre-cataclysm, since after it the number of remaining people already will not be able by the united consciousness to cause laser beam of huge power. As a result the civilization of Earth will remain at the level of the Crystal structures and will be destroyed by the ever-increasing global cataclysms of the planet destruction. The lying Aswan obelisk - the failed Transition. 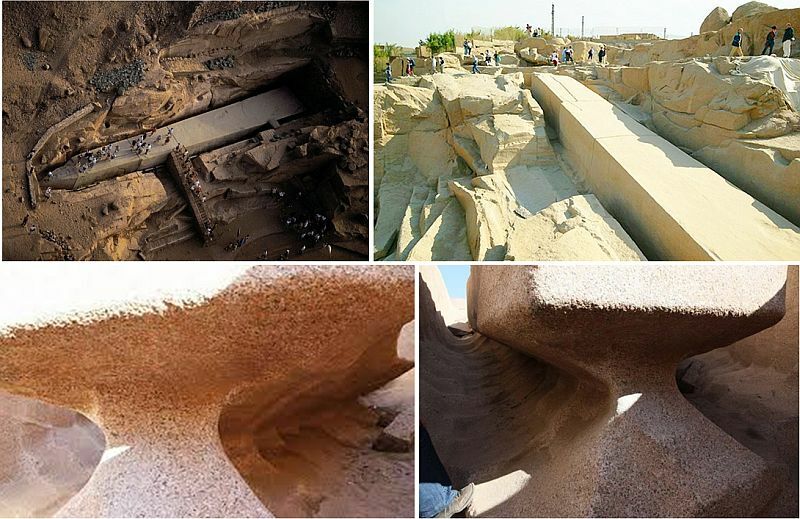 This error of the civilization and the failed Transition demonstrates a huge the only lying obelisk in the granite quarries of Aswan in Egypt, which is depicting not lighted laser beam. The length of the obelisk is slightly less than 42 meters, its weighs is about 1,200 tons, and its manufacturing technology is unknown. The Obelisk-giant, not completely separated from the rock, remained unfinished and not raised, depicts a situation in which humanity has not fulfilled the main condition for the Transition – mutual understanding and love. And that’s the only why, humanity had not been able to ignite already seemingly completely created the laser beam, depicted as the obelisk, which remained only to raise. So, directed up the Aksum Obelisk, depicts the laser beam caused by the united consciousness of humanity on the basis of mutual understanding and love. This is - the apotheosis of the human consciousness! The predictions of the famous American «sleeping prophet» Edgar Cayce about the last the 44th President of the United States means, that the blows of the three pre-cataclysms have to start this year. That is why, the creation of the laser beam of incredible power that depicts the Obelisk of Aksum, is the major goal of humanity for the continuation of life.